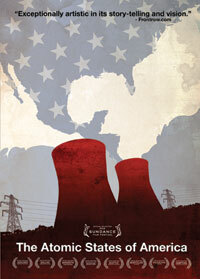 The The Atomic States of America DVD is available for home and community screenings, and for classroom use to provide a comprehensive exploration of the history and impact to date of nuclear power, and to investigate the truths and myths about nuclear energy. The DVD includes two versions of the film -- 70 and 90 minutes in length. You can show whatever version is best for your gathering. Choose one of the options below depending upon the type of screening you'd like to organize. We'll send you the DVD and a link to list your screening on our Find a Screening. You can also download a guide and publicity materials to help plan and promote your screening. Contact us for any help you might need: support@videoproject.com or 800-475-2638. DVD with license to host a small screening in your home (1-25 people). For a screening in a public place, school, college, business or library, choose an option below. DVD with license to host one free public screening for up to 100 people where no admission fee is charged. DVD with license to host one public screening for up to 100 people, with permission to charge admission. DVD with license to show the film publicly on up to five different dates to crowds of up to 100 people at each screening, with permission to charge admission. If you wish to show the film publicly to a crowd of more than 100, or purchase more than five screening licenses, please contact us at support@videoproject.com. We encourage big screenings and multiple showings but need to determine the fees on an individual basis. For license to use the film in a school or college classroom, a public library, business or government agency you must purchase this version from our distributor, The Video Project.